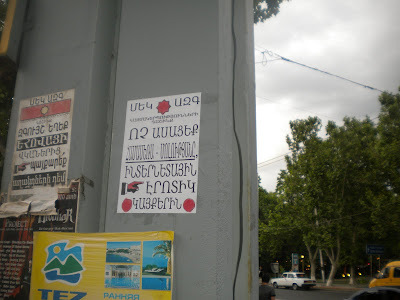 Apparently, homophobic posters appeared all over Yerevan. They are prepared by ultra-nationalist right-wing group who call themselves Mek Azg (‘One Nation’). In short, the group of a*holes. This group is known for its constant hate posters and speeches towards various groups or anything which is beyond what they consider ‘suited our nation’. Not only this group’s activities promote hate, but they are also responsible for littering Yerevan streets with their garbage, and should be made to clean up the mess they are responsible for and pay for it. This time the reason for his outburst was discussions at Parliamentary Assembly of Council of Europe of a resolution on gay rights and gender identity. Aravot’s editor Aram Abrahamyan expressed his dismay at what he considers false displays of “European values”. “No one can convince me that [sexual] relations between two men are as normal as between a man and a woman”, writes Abrahamyan. He calls homosexuality “disgusting”, “disorder” etc. He is convinced that discussions of such issues discredit PACE and Council of Europe (and “European values”) in Armenia. Armenian MPs Artsruni Aghajanyan and Naira Zohrabyan were among 25 parliamentarians who voted “against”. The resolution was adopted with 51 “in favour”. (they did not vote for Recommendation which was adopted too). Naira Zohrabyan is a representative of governmental coalition member Bargavatch Hayastan (‘Prosperous Armenia’) party. In public, (along with her party) she is acting as a very pro-European, advocating Armenia’s integration into the EU etc. As it frequently happens, the reality is far from her public statements. She followed “advice” of Armenian church on voting against the resolution. Ironically, head of the Prosperous Armenia party, famous Armenian tycoon Gagik Tsarukyan, last year was awarded a “Best European of the Year” at a ceremony in Yerevan for “spreading European traditions in Armenia’s political and public fields” and assisting in a “generation change” in the local political arena. My post back then was full of sarcasm. Not that we needed more proof, a justifiable one.